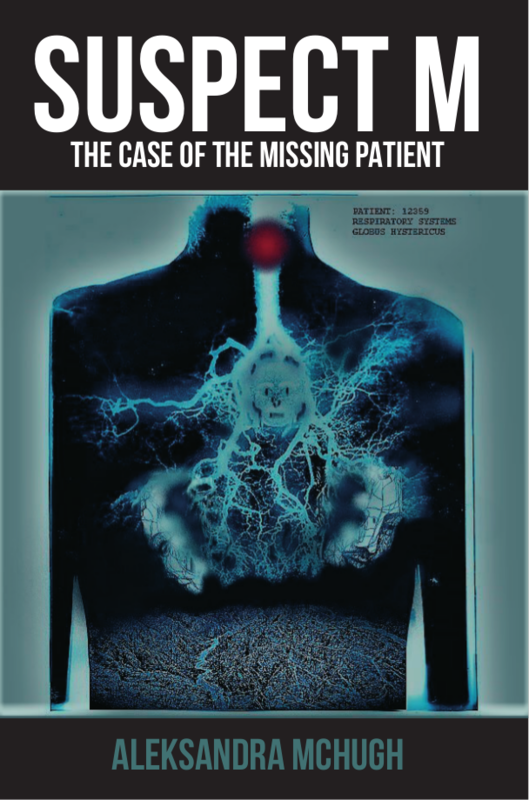 Suspect M: The Case of the Missing Patient chronicles the both real and fantastical asylum journeys of Lucy, an “older woman” and long-time “mental patient”. During her stay at the penetrated asylum of Dr. Crepetus, she takes on many demons, including discrimination as experienced by women labeled in a psychiatric institution, the perils of online dating in middle age, and psychiatry as abuse. She navigates psychoanalysis as offered by Crepetus, along with his disdain for her very real intellect and persistence. Within the twists and turns of the asylum and her psyche, she finds Sophia, a patient a bit older than herself, who just might know the way out. The narrative is often a series of underground tunnels and chambers, perhaps created for the entertainment of those not ensnared. Will Lucy sink or float if it is flooded? Will she grab onto Sophia’s hand and escape, or be torn apart by a killer-suitor? Of course she is suspect, being a woman, and that kind of woman. Yet, in the end, who is the real Suspect M? Rabbit holes. What can you do? They’re everywhere—outside and expanding, inside and tunneling. You could spend your life down one, naval gazing. It happens. This one had a compelling 1915 actual black-and-white rabbit beckoning Lucy A to leave her body and follow him while playing a dirge-like cover of “Funnel of Love” (see Squrl cover). He might have had a concertina. Why a Funnel of Love? Because she entered through the latest dating app of the long-standing psychoanalytic “love cure” – the same one that inspired all manner of interventions, from vibrators to clitorodectomies to prescribed marriage for intractable women, i.e. hysterics. This once “black beast of medicine,” was also subjected to all sorts of trials, like witch-tests, to prove her willful malingering. Didn’t work. Sorry, spoiler. Many DSM mutations later, her inheritor, the “borderline” remains the most notorious of patients, deemed similarly incurable, parasitic and plastic, absorbing the fears and anxieties around her, projecting them back through mysterious physical symptoms that communicate, among other things, muted antagonism. Borderline to what? Worse realities: deadness, psychosis, the unconscious, whatever lies outside taken-for-granted boundaries of, say, skin, time. If you go deep enough you’ll glimpse some hell or other. Ever watch “Some Ordinary Gamers” with Mutahar (don’t recommend) or “I’ve Seen Footage” by Death Grips (go ahead!). It’s like that. In this case, it’s the “severe wards,” a leftover from Charcot’s La Salpetriere hospital for hysterics, now revamped and with paranormal tours given by the facility’s Dr. Crepitus. And Lucy does follow, to land on a heap of sticks and dry leaves. Or, that’s the first rung of the tapering circles of ledges that grow smaller as she descends so as to get more and more constricting, along the way merging with the usual archon-like suitors you meet on dating sites. You have the armed paranoiac, Sid M, and his associate, the Handler (who happens to be a wolfsangel), the White Pony curator who’s really a unicorn with a Tetsuo horn, the South African cigarette smuggler, Blue Eye. All of them borderline patients whose alt-worlds are integrating, much as a (apparently) singular ego might. All of which might have something to do with the missing Sophia P. Might. It’s a MYSTERY. Author Bio: A recovered academic and sometimes writer, Aleksandra McHugh’s past work includes short stories (Broken Pencil, Black Heart), non-fiction articles (Briarpatch), dialogues (Bad Dates), and spoken word performance, mostly in the style of dramatic monologue (Love Addict: Trials in Online Dating; also available as self-published zine). Suspect M is her first book. A record of something akin to a spiritual breakdown, Parts 2 (The Metanoia of Sophia P) and 3 (Sid M’s Extended Grievance) are in progress. She also operates a rooming house. Typical maybe, but her best gig is mother.